By default, the portfolios in your connected brokerage accounts (that is, the portfolios that appear in the Brokerage Connections panel) will be linked to a new portfolio with the legal name of the portfolio as it appears in your brokerage account. To link it to a different portfolio in Stock Rover, click the grey dropdown arrow, circled below, for a ‘Quick Portfolio Link Change’ menu. Select the one to which you want to link your brokerage portfolio. You can also select ‘Not Linked’ if you don’t want that brokerage portfolio to be linked to a Stock Rover portfolio. Once linked, a portfolio in Stock Rover can no longer be modified, only viewed. You can, however, edit the buy price in the event that Yodlee does not import the correct buy price. To do this, load the portfolio in the main Table, open the Portfolio Performance view, and hover over any cell in the ‘Buy Price’ column. You will see that the cell becomes editable, as illustrated below. Simply enter the correct buy price and click away from the cell to save it. If you wish to modify a portfolio’s history after it has already been linked, you must temporarily unlink it, make your changes, and then re-link the portfolio using the method described above. 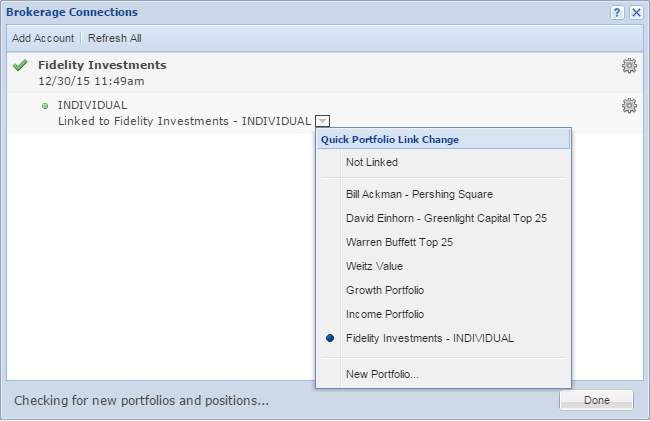 Note that the new portfolios that were created when you connected to your brokerage will not be deleted or removed even if you change the linking. They will remain as unlinked portfolios in your account unless you delete them (instructions for deleting below).